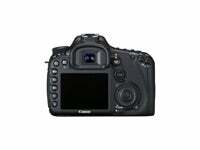 The body is made from a rugged magnesium alloy structure and weather sealing on a par with the professional EOS 1n film SLR, making it feel very sturdy. Buttons are plentiful but useful and well spaced to avoid accidental presses, with the large rotating dial featuring a lock function. The new live view button sits just neatly to the left of the thumb’s natural position, with a start/stop button and a switch between the two modes. Other additions include a Quick button for access to the main feature set and a Raw/JPEG button, which adds dual format to the next shot, no matter which you are currently shooting in. The rest is reminiscent of the 5D Mk II and therefore already a proven success. The menu is divided into colour-coded icon-based sections, which can be scrolled through using the mini joystick control or the finger dial and large rear dial. 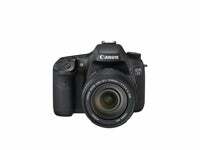 The camera seems designed to be fine-tuned and customised to your own style of shooting. At first this can seem a little like overkill, but for extended use and those used to working in set ways, does make a great deal of sense. The one criticism is that, with so many menus and option screens, finding the function you’re looking for can be tricky, and until you get to know how it works you may find yourself experimenting with button combinations and having to scour sub-menus. 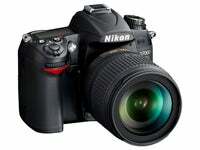 Although a fair amount behind the scenes is new, the look and feel of the D7000 is still very much a Nikon at heart. The camera’s layout comprises a light-up display panel to the top right, with a mode dial and surrounding drive mode dial to the opposite left hand side. To adjust the drive mode a small button requires pressing to release the dial lock – this can prove a little fiddly despite a raised, textured edge, yet is no different to previous Nikon body designs. 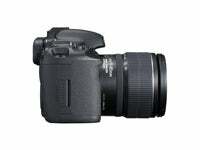 For control of most key options the D7000 adopts a dual thumbwheel system, which makes quick-adjusting manual controls a breeze. Both thumbwheels are well positioned on the front and rear right-hand side of the camera and fall well to the hand. 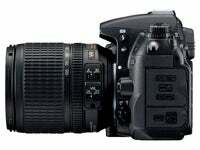 On the rear is the main LCD screen centerpiece and, although there seems to be demand for vari-angle screens of late, the D7000 opts for a traditional fixed-screen. The viewfinder above this has a 0.94 magnification and as such is fairly large to the eye but would benefit from a more pronounced eye cup to fully seal off external light and lock around the eye more smoothly. A plethora of function-type buttons around the camera body also come good in use: to the front left side of the flash is a BKT (bracket) button; a Depth of Field Preview button is to the front of the camera by the lens base; the Fn (Function) button can be found above this to the top right of the lens; exposure compensation and metering selection have their own individual buttons next to the shutter release; and three of the four main buttons to the rear left can be pressed and held for further quick adjustment of the major options. In short, you’re never far from quick and easy control. 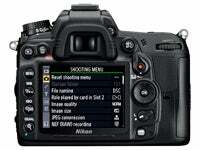 The EOS 7D has all the important controls at hand, but the Nikon D7000 offers far better placed shortcuts around the body, reducing the need to venture into the menu system.